Program #WOLR008. Recorded in Syracuse, NY on September 27, 2013. Through its myriad booms and busts, capitalism manages to roll with the punches and emerge standing. We are constantly told: it’s the only show in town. Do you want the old Soviet Union? No way. But can’t we imagine an economic system that is responsive to the needs of people and our precious planet rather than Wall Street and the investor class? Idealistic, you say? Maybe. But the fiscal ship is headed for a huge crash and no amount of moving the deck chairs around will avert it. Capitalism’s tattered and moth-eaten clothes have fallen off, revealing a naked body that serves only the privileged few. Ninety-five percent of the economic gains, since the so-called recovery began are going to the top 1 percent. Meanwhile, median household income, adjusted for inflation, keeps dropping. The system is rigged to favor the rich. now I will buy the CD and give it to them. Thank you! 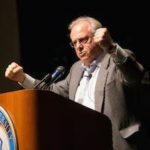 Dr. Wolff is one of our great, clear-thinking leaders into the economic future of our country, and he demystifies traditional economic theory so as to present a clear and, actually, realistic set of modifications to the status quo. His world-view is not unrealistic. Little by little, change may be possible. I would like to find some of his earlier lectures on CD so as to make gifts to friends who are not computer-savvy. It is really sad that for those very few that have something to say about today’s world, such as Richard Wolf, people have to pay to listen to!